Thursday evening saw the opening dance salvo of this year's Fringe Festival: the world premiere of Reggie Wilson/Fist and Heel Performance Group's Citizen in the FringeArts space under the Ben Franklin Bridge. Salvo is the right word: Many of this year's Fringe dance performances will have, in different ways, this explosive quality. Citizen drove its heart-stoppingly relentless message home without firing a shot or saying a word. Profusely varied repetitions of many spiritual-movement phrases by each of the dancers were based on enslaved African American worship practices called by their masters "fist-and-heel" dancing. Four of Wilson's regular troupe - Raja Feather Kelly, Yeman Brown, Clement Mensah, and Anna Schön (all in black and white costumes by Enver Chakartash) - are degreed from various universities worldwide, something the early Fist and Heel dancers could never have dreamed of. Each took up the first hour in deeply felt, stinging solos. Schön was a powerhouse. Mensah, each time his turn came, ritualistically removed his kneesocks before yanking his body into unthinkable positions. 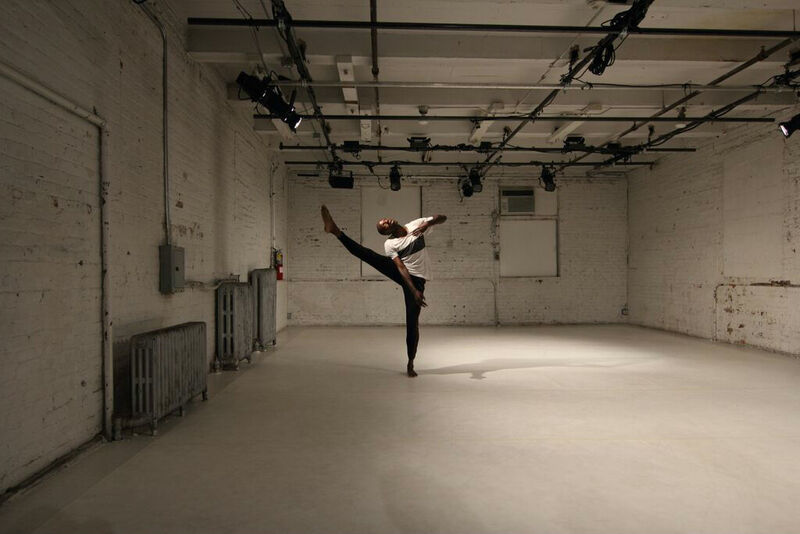 Clement Mensah, one of the performers in Reggie Wilson/Fist and Heel Performance Group's "Citizen." Photo: Aitor Mandilibar. Brown was perhaps the most freestyle-looking of the four, yet his repeated reappearances belied that. But Kelly stole my soul as he stood sideways to us, trancelike for perhaps 10 minutes, knees bent, just swiveling his hips before taking up more of the floor. Annie Wang appeared in the last 15 minutes to introduce the first unison dancing in this compelling work, which ended with arms upraised as the lights dimmed. French choreographer Boris Charmatz's 90-minute tour-de-force Levée Des Conflits happened Friday night in over-90-degree heat at the Drexel Armory. Fans and water were provided to the audience. Each dancer entered and began a movement that looked like washing the floor. Some were desultory, others attacked the task with force. In the next phrase, they slapped their arms around their bodies as if in religious flagellation. In his program notes, Charmatz quotes Roland Barthes regarding "the neutral as a desire for the suspension of conflicts." In French, Levée means "lifting," and the onslaught of 24 dancers repeatedly performing 25 dance phrases to fortissimo piano and blaring brasses by Henry Cowell, Conlon Noncarrow, Helmut Lachenmann, and Morton Feldman felt less like a suspension than a lifting of conflicts or like some catastrophic event. The entire group slid to one side, like people on a cruise ship's dance floor in a hurricane. Occasionally, one dancer stopped at a fallen troupemate and ran a hand soothingly over him or her. Otherwise, there were no interrelations between the dancers, each seemingly unaware of the others. As each separately walked offstage, I saw this as a work that variously critiques - and neutralizes - observable structures of sound, movement, staging.